Start cycling more! Not just when you go to work, but especially while you are at work. This is possible with a Deskbike from Worktrainer. While you are working, you will bike yourself completely healthy. But also smarter, because by exercising, your brain remains active, which will lead you to have amazing ideas. Get out of your chair and start alternating between biking and standing from now on. Your body will thank you at the end of your workday! The Deskbike is used with a sit-stand desk and provides your body with some healthy exercise while you're working. Use the free Deskbike App to monitor your exercises. Burn calories fast? The InMotion is the solution for training your calves, thighs, and buttocks behind a regular sitting desk. Get your body and work InMotion! Deskrider is a mini crosstrainer, with which you can keep moving from your office chair. A seated elliptical which lets you get a workout in without sacrificing time. Features a built in display monitor to track your workouts. Partial exercise bike, partly ergonomic desk, the Deskcise Pro V9 helps you maximize your activity level while working on the laptop, tablet or smartphone. The Stamina Workstation is a deskbike and standing desk in one. Getting on and off is a piece of cake because of its low height and the adjustable tabletop. 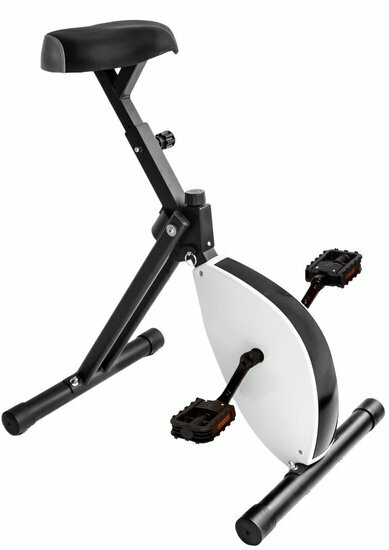 The WIRK Ride with Strength System combines upper and lower-body exercise capabilities with an adjustable workstation. All-in office solution. An All-in Office solution. This exercise work is a perfect tool to exercise your legs under your desk while you work. Included with display so you can read your results at any time. Stay aware of your biking performance. With the wireless Deskbike bike computer you can keep track of your speed, distance, duration and calories burnt. Do you have an old Deskbike without a Speed and Cadence meter? Purchase 1 and send your achievements to the Deskbike App. The sensor works with Bluetooth. Lower your Deskbike with the Seat pillar Small. Suitable for users with a body length of 140 cm to 165 cm. Is widely used in schools. Handy anti-slip ring for office chairs with wheels, for use of the Inmotion, Deskrider of Cubii JR. That way the office chair does not slide away when you are cycling under a desk! Create a Deskbike parking spot. That way, everyone can see where you can get the Deskbike from. Work while cycling? It's possible! The Deskbike is used in many companies nowadays, even Minister of Health Edith Schippers uses this bike. 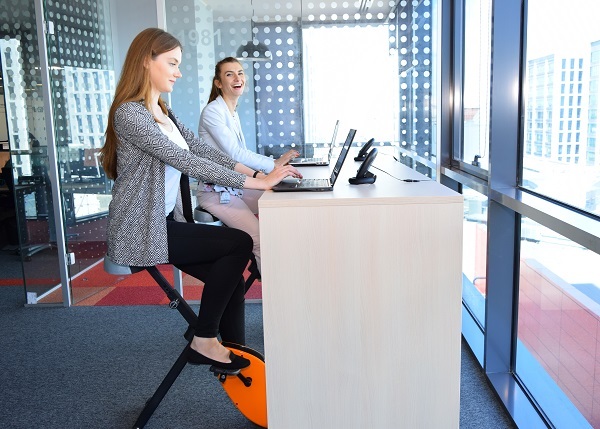 Ortec, in Bulgary, has also placed a Deskbike with all the standing desks. At Achmea in Leusden, colleagues will have to fight each other from now on, to secure a spot on one of the 300 Deskbike workstations that have been created. This is made possible with the help of 'Gezond Werken', the initiative within Achmea that cares for inspiration and support of body, mind, heart, and soul. Rob from Steam is happy with his red Deskbike! As an inland skipper, you can also keep moving. Andre introduces the Deskbike to the Municipality of The Hague. Giel Beelen during his effort to break the world-record for radio making. Awesome! Sportcentrum Papendal NOC*NSF also exercises on the job. Oracle: improving your fitness level while making money at the same time! Paul Rosemöller from the VO-Raad on the Deskbike while being interviewed by BNR. Watching 8 monitors at the same time? The Security staff at Schiphol Group remains focused with the Deskbike. Joost has attracted a good client, and has rewarded himself with a healthy workstation in his home office. Cycling while having a meeting, it is possible at Philadelphia. Mariette from TNO tests the InMotion underneath her desk. What do you mean, sitting still? De Wegwijzer leads by example. Reed Business has placed Deskbikes on every floor. Cardiologist Dhr Leonard Hofstra: "I do my administration on a Deskbike, and that way I cycle about 30 km a day." Albert has raised his desk with two boxes of paper, bike away! Psychotherapist and supervisor Rob Faltin has his own practice, "DoePsy", in Amsterdam. You could say it's a cycling practice, because he and his clients are cycling during the consultations. The audience in exercising at the conference Alles is Gezondheid. The Dynahouse of IT-staffing lets its clients work dynamically.